Cost codes allow costs to be tracked for various types of project activities. Normally, cost codes are determined and set up the in the company accounting system and duplicated in RADAR. Users with admin level permissions to the Activitiy Manager can setup or change the Company Cost Codes. Project cost codes are created by importing the company cost codes to the project. Cost Types and Categories help define and categorize costs for defining and reporting costs throughout the project. Cost Categories are categories of cost types. 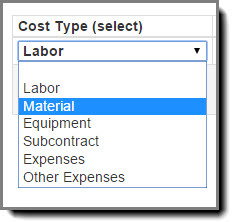 For example, a company may want to categorize labor costs into categories such as, field labor. Cost Codes are specific costs within a part of phase of a project. Cost codes provide detailed information about where and how money is spent and helps to provide determine if the project is staying on or exceeding the budget.